I started writing this post with EBTG’s “When all’s well” playing in my mind; I explain: this tart is a result of some stressful moments, but it all worked out fine in the end. After refrigerating the pastry for at least 1 hour, roll dough between two sheets of lightly floured baking paper – if dough gets too soft, refrigerate for 5 minutes. Line a lightly buttered 30x10cm (12x4in) loose-bottomed tart pan with the pastry. Trim edges with a knife and prick the base with a fork. Freeze for 30 minutes. Preheat the oven to 180°C/350°F. Line the pastry with a piece of buttered foil and fill with baking weights/dried beans. Bake for 15 minutes, carefully remove the weights/beans and the foil, then bake for another 10-15minutes or until the pastry is golden and crisp. Set aside to cool completely. Make the filling: place the chocolate, heavy cream and orange zest in a small saucepan over low heat and stir until melted and smooth. Remove from heat and allow mixture to stand for 10 minutes or until slightly thickened. Pour the ganache over the pastry shell and smooth the surface. Refrigerate until ganache is set, 1-2 hours. Dust with cocoa to serve. This tart looks amazing!!! The crust is perfect, and I can only imagine the flavor! That looks lovely! I think I would have still used the marmalade (or some of it) in a thin layer over the pastry, before pouring in the ganache. Chocolate and orange are lovely together. 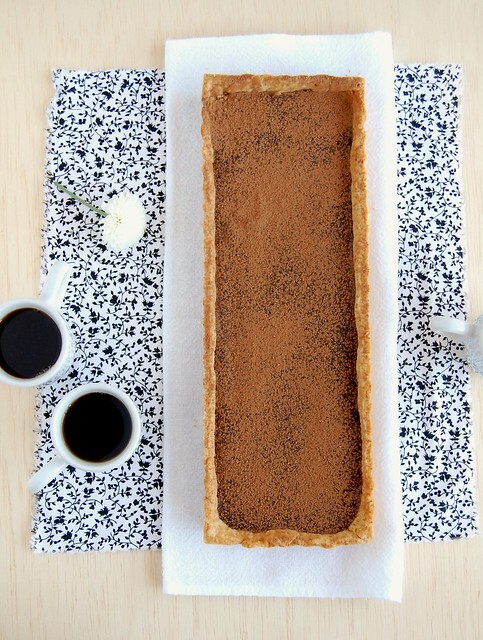 You're tempting me to get a rectangular tart pan with this lovely treat! This looks divine! I love that it has only a few (but lucious) ingredients as well. Too bad about the pastry strip accident, but if it inspired you to make this, I'd say it was a happy accident ;-) Thank you for another wonderful recipe! Oh I hate it when you drop an integral part of your dish on the floor. It happens to me quite often because I am accident prone, but what a wonderful solution you have come up with. I think the tart looks amazing! I love orange and chocolate together. Looks sensational. I can almost taste it from the picture!!! This looks wonderful, I love the simplicity of the ingredients. These pictures are beautiful, but I would have loved to see photos of the 'disaster.' I thought I was the only one who did those kind of things!! !